Pet health insurance can be a real relief to pet owners. It helps ease the burden of costly veterinary procedures and bills during highly emotional times. It can also be a great way to ensure your practice is helping as many pets and pet owners as possible. All too often pet owners don’t know the benefits of pet health insurance—the best way to change this is for veterinary practices to show that they support pet health insurance. Deciding what pet insurance policies to offer your clients is one thing, but before that, here are some ways to get them on board with the idea of pet insurance. Simply talking to pet owners coming into your practice about pet health insurance can do a lot to help change their minds. You could talk about issues like the rising cost of treatment and how insurance protects against it. Keep in mind some fears and misconceptions about insurance that pet owners may have—perhaps they think it won’t actually cover them when their pets really need it—and do your best to show them how that’s not the case with high quality pet insurance. Unique pet insurance concepts like Vetsure connect pet owners to high quality pet care providers. By choosing a company like Vetsure you are showing pet owners visiting your practice that they will be part of a highly qualified and secure network whenever their pet needs urgent care. This close relationship between Vet and Insurer gives customers real reassurance and peace of mind. Having one ‘designated pet insurance expert’ in your practice will make sure everyone knows who to go to for answers. This could be the practice manager or it could be the receptionist: with a little bit of research into your pet insurance company they’ll soon be able to answer any questions your vets or clients might have about pet insurance. Dependent on how involved you want to be with your insurer most will offer comprehensive training programmes. Pet owners like to look up practices online to see how their pet will be cared for. Add a link to your site showing that you support pet insurance: it will help them to see that they should too. If they can see you have a connection to a trusted pet insurance company like Vetsure, this will add to their trust in you, trust that you have their pet’s best interest at heart. When you have patients that are insured, make sure you have their insurance details readily available. Noting down their insurance company name and claim numbers on patient’s records is a great way to do this. It will make sure that insurance claims are handled as quickly as possible, ensuring that your insured pet owners don’t feel let down or adrift at any part in the treatment. 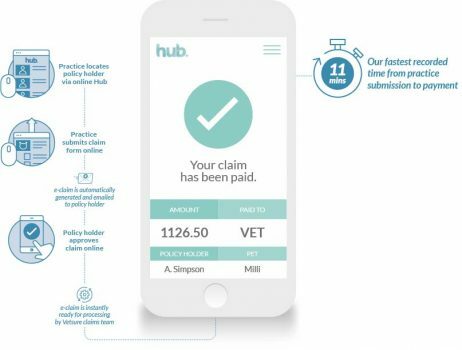 What’s more, if you team up with Vetsure, at a touch of a button you can look up any customer or claim on our new and innovative ‘Hub’ app! Helping your clients submit claims forms means that they will be paid in a timely manner: this will keep your pet owners happy! Making the insurance process as clear and easy as possible is a great way to get your clients to see the benefits of pet health insurance. With Vetsure’s new digital claims system the process is even easier, upload the information electronically and we will collect the clients’ e-signature for you! No more clumsy paper forms or chasing clients for signatures! If your employees get to know the good things about pet insurance first hand, it will be that much easier for them to talk to clients with confidence about its benefits. Most insurers will offer a staff discount, at Vetsure we offer 25% off their policy premium. Free trials are a great way to introduce pet owners to insurance. It’s worth looking into what pet insurers are offering, and passing that information on to your clients – but beware, some free trials can have potential pitfalls that you should be aware of. The most common being gaps in cover, Vetsure however, offer a secure way around this problem and exclusively offer their network of trusted vets the opportunity to offer their clients a 5 Weeks’ Free no-obligation trial. By helping your clients know the benefits of pet health insurance, you’re helping them make sure they can get their pets the best possible care. Get in touch with us if you want to know more about becoming part of an expert network of vets.